2011: rolling out a new blog for the new year! I’ll be writing about my art, my inspirations, my creative process, and my travels. I work under the name Coffee Cup Press. I chose the name 10 years ago as it ties in so well with so many of my interests. And how is that, you may ask? Well, a cup of coffee is a staple of my life! 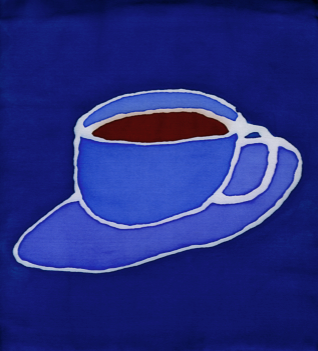 A cup of coffee is always by my side as I do my thinking and planning, as I create and strengthen friendships, and before I head to my studio to pull out my dyes, paints, and inks. Coffee fuels my inspiration, my work, and my creativity. The word ‘press’ has to do with many things: I use a French Press Pot to make coffee, I press fabric with an iron both before I use it and after I dye on it, and I create and print pamphlets, portfolios and books. So you see, ‘coffee cup press’ is synonymous with my art and with what I do. The piece you see is my original logo, and I used to hang it at the end of every solo show - as punctuation, as an ending and a continuation, as a statement: “this is where I come from; this is what I love”. My love for travel is as great as my love for coffee, and I find much inspiration in traveling, seeking, learning, looking. My favorite way to work involves traveling to new locations, creating sketches on the spot, and returning home to create a new body of work to exhibit. I love to share those works with the location itself, showing the beauty that outsiders see, beauty that may have become invisible to those who experience it every day. These works are also an excellent way to share the beauty of what I experienced with those who cannot travel to the location itself – the architecture, the genius loci, the sense of place, the special light, the colors of the setting sun on a skyline. Though I have mostly exhibited works on silk in the past few years, my art is more than designing on fabric. My dreams are big and I foresee many more mediums in the future. My mission is to bring beauty into the lives of the people I know and those I hope to meet in the future. I hope to spread my vision and my experiences to a larger audience, and I hope you enjoy this blog. Feel free to comment or to send me your feedback. Weekly posts can be found here, or delivered to your mailbox via the RSS link at the top of this page. Best wishes to you and yours for the new year.